Learn how to decorate your home, Belgian style. Simple, luxurious, and with a healthy mix of old a new elements, Belgian interior style is in a league of its own. Some compare the energy of a Belgian-inspired room to a shabby chic aesthetic, and while there are some similarities between the two looks, Belgian decor and design has a clean, exhale-inducing quality that sets it apart from conventional shabby chic style. Rife with warm neutral hues, organic materials, and oversized furniture, a Belgian room is one that feels rich and elegant while retaining a comfortable, welcoming feel that invites anyone to sit down and stay a while. Personal aesthetics that can easily accommodate this style value timeworn elements paired with brand new decor and a simple, pared-back look that doesn’t sacrifice warmth or comfort. The beauty of a Belgian aesthetic is that there’s plenty of room to grow, play, and personalize with it. Whether you’re looking to completely transform your space or simply add a few touches of this inviting style to your home, get to know the defining elements that cause so many to covet this unique aesthetic. Neutral colors are a defining characteristic of a Belgian interior, adding warmth and a sense of peace to a space. But not just any neutral hues will do; Belgian interiors adopt neutrals that lean toward light and airy, akin to unfinished wood and natural stone, like the grays and beiges found in this stunning design by Cassandre & Quentin. Linen is a longstanding key natural resource in Belgium, so it only makes sense that it became a staple of the aesthetic. An easy way to incorporate this material into your design is through window treatments. Linen curtains offer a uniquely light but elegant feel to a design, like these from Restoration Hardware, which you can purchase starting from $235. Organic materials, like natural wood, ceramics, and stone, play a major part in Belgian designs. 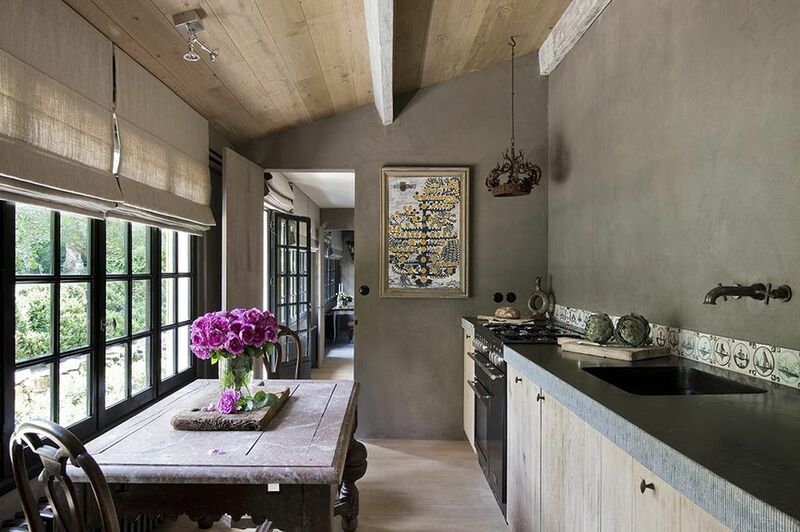 But rather than incorporating incredibly polished and impeccably finished natural accents, a Belgian interior opts to keep these elements in their natural form, such as the raw wood and chalky ceramics found in this space from Vicky’s Home. Oversized furniture, typically upholstered in linen fabric, is a staple of this aesthetic, but the key is to not use too much of it. A Belgian interior is one that values the welcoming comfort large furniture brings but not at the expense of a simple, pared-back design. Consider just a few large pieces to nail the look, like this space from vtwonen. If there could only be one word to define a Belgian style sensibility, it would be patina. Patina describes the appearance of oxidation on metals and the sheen on wooden furniture from years of polishing and cleaning. That said, the style is full of vintage, timeworn elements that lend a rich, weathered feel to a look. Antique sculptural artwork and natural, aged wood fits right in, such as this Axel Verdoordt design, shared by Brooke Giannetti. Amid all of that patina are also plenty of new elements, which is one of the components that makes a Belgian aesthetic so dynamic. Old world accents merge with brand new ones to create a visually layered look. In particular, industrial elements, like the pendants in this room from Sugar Cube, are common in Belgian rooms, providing a fresh modern feel to the otherwise old-world quality of this style. Given how much emphasis is placed on elements from nature, it only makes sense that Belgian rooms are frequently awash in natural light. As this stunning space from Franck del Marcelle exemplifies, sunlight has a knack for making this aesthetic appear even softer, warmer, and more inviting than it already is. Don’t let the oversized furniture and abundance of organic layers fool you—clutter has no place in a Belgian home. Pared-back simplicity is a primary tenet of this style, allowing all of the aforementioned components to play beautifully together without overwhelming the space. Think Scandinavian minimalism and hygge merged together for interior perfection, like this space from Scandinavian Retreat.